honey & jam | recipes + photos: classic pound cake. Oh, pound cake. How I both hate you and love you. You are so awful for me, with all your sugar and butter. But you are oh so delicious. I had originally planned to make banana cream pie this evening, but I just wasn't feeling up to making whipped cream (if you haven't tried homemade whipped cream, I suggest you do right now. You'll never eat cool whip again). So I was flipping through cookbooks and found this recipe for the classic pound cake, and decided I had to have it. Pound cake is definitely one of my favorite desserts, and this one was great, I just wish I had some strawberries to put on top of it. Yum. In a medium bowl, whisk together the flour and salt; set aside. In the bowl of an electric mixer fitted with the paddle attachment, beat the butter, sugar, and vanilla on medium-low speed until light and fluffy, 3 to 5 minutes, scraping down the sides as needed. Add the eggs, one at a time, beating until combined. With mixer on low speed, add the flour mixture, beat until just combined. Spoon the batter into the prepared pan, and smooth with an offset spatula Bake until cake is golden and a toothpick comes out clean, 50-55 minutes. That looks SO good. And yes, once you go to whipped cream, cool whip is a disappointment. Thanks for the recipe - I've been looking forever for a good one (not that I need it after Christmas!) We always had real whipped cream growing up, so the first time I tried Cool Whip I was amazed that anyone could eat it; it just tastes like chemicals to me. I think it's not so much the pound cake itself that's a killer but all the wonderful things I want to add to it like chocolate sauce and yes, whipped cream! I love seeing all your baked goodies! gorgeous picture! 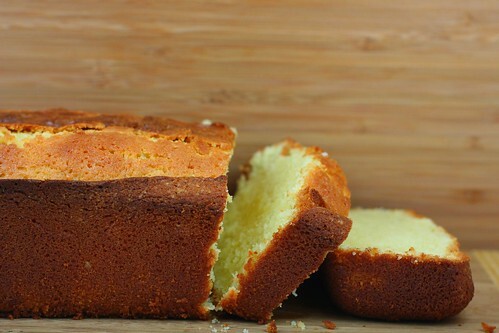 your pound cake looks so light and fluffy -- just perfect! Oh my goodness! I have never made a pound cake before. I'm going to have to remedy that soon! Thanks for the recipe! Wow. Three sticks of butter? That is bad for you. But it looks soooooooooo good! Alas, my family has placed a moratorium on all baking for the indefinite future :( They say that they've gained weight over the holidays thanks to me. Bahh. Oh well... now we switch gears to "healthy" meal options! I made some oatmeal pecan pancakes with berry sauce yesterday that were YUMMY. You're killin me here. I LOVE me some pound cake. And the pounds love me. Sigh.